Beside rich with museums and tourist attractions, Stockholm also has several events and festivals that unfortunately if pass up. It’s good to visit to Stockholm when one event or festival was held. Most of the events and festivals held during the summer. This may be the reason for you to come to Stockholm in the summer. Here are some of the popular festivals in Stockholm. Maybe popularity Festival Midsummer ‘Eve in Sweden can be compared only with the Christmas festivities. Midsummer was originally a traditional celebration to honor the earth, a fertility festival with a wooden pole as a symbol. The ceremony was held in the hope of harvest in the fall will be fine. Midsummar is the longest day of the year, when the sun shines until midnight. At the present time, midsummer is celebrated every June 21 set as a national holiday Sweden. While the Midsummer’s Eve takes place on Saturday from 20 to 26 June. Stockholm community celebrates this festival by gathering with family and friends. They eat herring and potatoes. Then covered with beer. Even so, do not be afraid of loneliness in Stockholm because there are thousands of people who celebrate Midsummar’s Eve at Skansen Open Air Museum. They were partying, dancing, and singing all night around a wooden pole decorated wreath. Various music and traditional dances also enliven Midsummar Sweden’s Eve. All the partying to celebrate the sun shines until midnight. Midsummer’s Eve Festival was originated from ancient traditions and devoted to fertility. However, for modern Swedish society said that this festival is a reason for them to get mad partying. 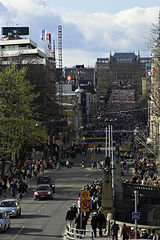 The annual Jazz Festival which began in 1980 is claimed as one of the oldest festivals in Sweden with an international reputation. Big name musician or a musician from Sweden international has been filling this event. In 2011, the Stockholm Jazz Festival re-enlivened by some famous artists like Angie Stone. Stockholm Jazz Festival is usually held mid-July and held at Skansen Open Air Museum. Looks like summer in Stockholm opened with food festival A Taste of Stockholm or in the local language called Smaka pa Stockholm. Everyone comes to Kungstradgarden on the basis of mutual interest will be food and drinks. During the first week of June, Kungstradgarden downtown park turned into a party area with a diverse culinary sensation and live music performances from renowned artists. About 25 restaurants in Stockholm serves traditional Swedish food exotic up food from various countries. Walpurgis Night celebrations performed as a celebration of the coming of spring. Swedish Society celebrated the end of a long winter and dreary spring by singing songs and lit a bonfire. Skansen Open Air Museum into a biggest celebration of Walpurgis Night in Stockholm’s. Walpurgis Night is celebrated every April 30 is a national holiday for King of Sweden Carl XVI Gustav celebration birthday on the same date. Swedish flag will be scattered in all directions in honor of the King. The state created a dual national holiday in Sweden since 1 May is celebrated as Labour Day. That way, when the Walpurgis Night party through the night until the next holiday on 1 May.